Don’t let living in a small space keep you from having a functional office. These small home office ideas as proof that great things can happen in small spaces. I’ve been working from home for about the past 7 years. We’ve also moved a gazillion times, which meant always having my home office in different areas of our home, depending on the space available. Sometimes I had a corner of a room. Sometimes I had an entire room. Usually, just a corner. 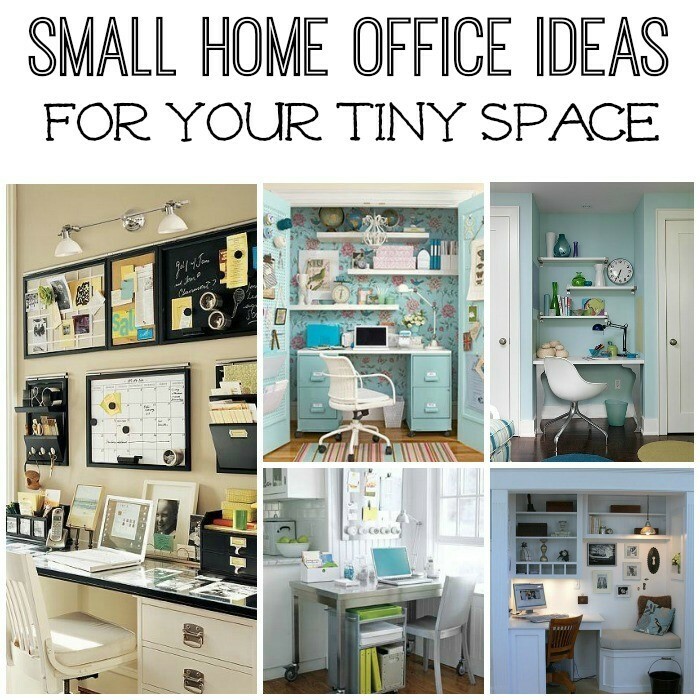 This gave me all kinds of opportunity to come up with small home office ideas through the years. When you work from home and you’re limited on space, you MUST get creative when it comes to small home office ideas. I have five fabulous ones to share with you today. They have given me some inspiration and I hope they give you some as well! This is the perfect idea for those of you who are short on space. This blogger takes you step by step on how to create a beautiful small home office from a $100 ebay find. This could go in any room of your house! It looks like she used two filing cabinets, white floating shelves, peg boards on the door and filled in with a great office chair and beautiful desk accessories. If you have one wall available to you and it’s out in the open, create a set up like this one which is well organized and appealing to the eyes. Always remember to look up when creating an organized space. Your walls are begging to be put to good use! Use a wall mounted calendar, white board and mail organizer for the wall area. 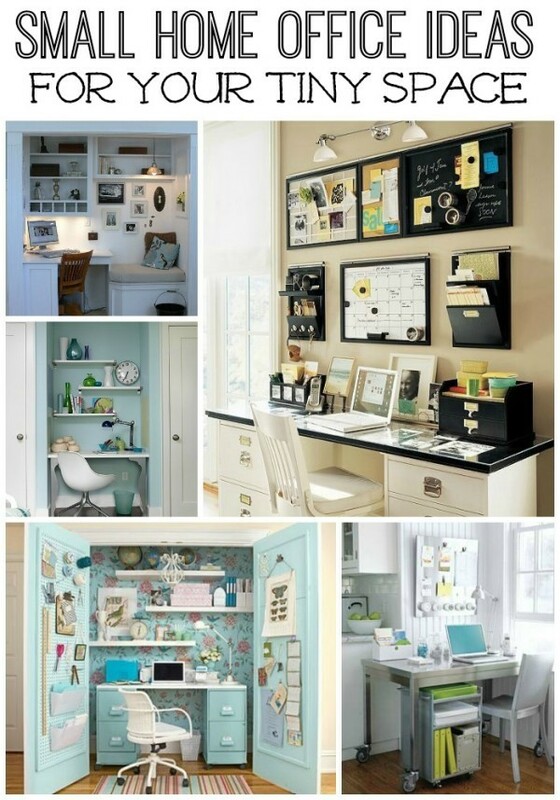 I love this small home office idea! It’s truly amazing what you can do with a small space. Do you have a tiny nook somewhere that’s just sitting empty or you’ve never thought about using it for anything? Here’s your idea. A mini home office! 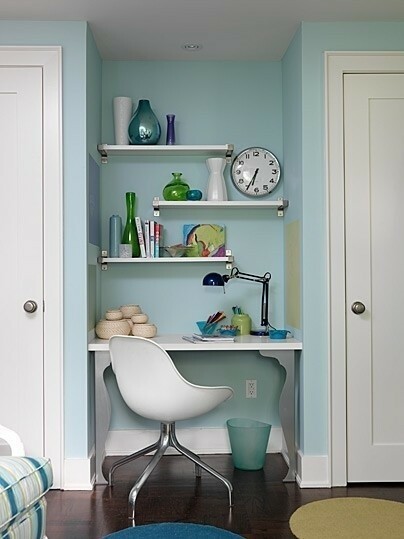 This space simply uses floating shelves and a small desk. 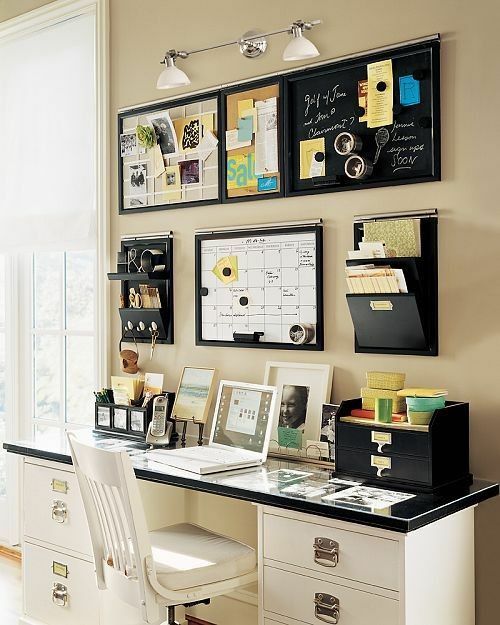 Utilize the side walls by putting up a calendar or white boards. The kitchen is actually a great central location for an office. It can be the family home office or even just your little space for working, paying bills or storing everything you need for a Family Command Center. 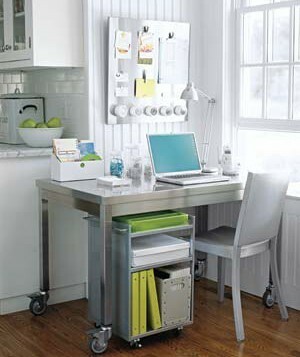 I really like the idea of a desk on wheels, as it makes it easy to move around. This stainless steel one is perfect. The cart is also on wheels, making this whole thing portable. 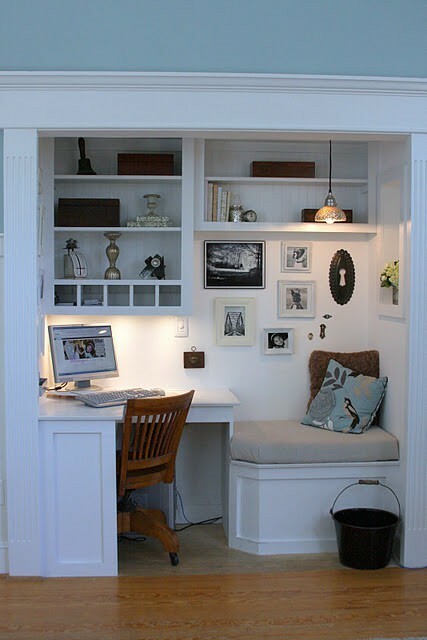 For those of you who are handy, this is a more permanent but absolutely functional way to create a home office space. 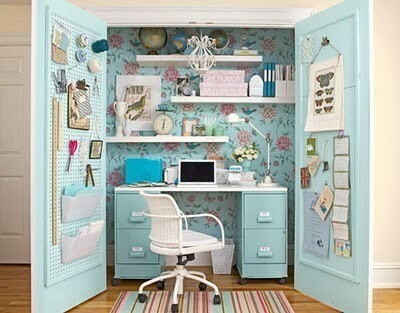 Turn an everyday closet into an office! Do you have a home office? Are you hurting for space? I hope these small home office ideas gave you some inspiration! Where is the white desk from, the one with the file cabinets on the side? I MUST have this!!! I’m not sure, but I’ll see if I can track it down! I feel in love with the white desk as well! I tracked it down. I found it at Pottery Barn, $734. The price is expensive but i want this desk. I guess i will have to save for it. Got to have it!!!!!!!!!!!!!!!! Beautiful ideas! Has anyone seen the light wall-mounted light fixture (over the blackboard). I’d love to purchase one for my home office. I would love to know where you buy the metal hanging rods for all the items on the wall? I want to know also. It looks similar to Rimforsa by Ikea. A tiny space doesn’t have to be miserable. Your ideas are really great. I work with many first time home buyers and often need small space tips to help them see what they can do in their first home. What great ideas! I have a smaller house and most of my space is filled with kid toys or dog beds. I’ll have to pin this to my Home Organizing board for later when I decide to build myself a small office. I to would love to know where you buy the metal hanging rods for all the items on the wall? I love everything about this wall, all done up in black, however I cannot find all these items you have here on amazon please help looking for this exact same idea for my office where do I buy all your items from? This is your ad for the One Wall I would love to do, I have the perfect area for this! !